We just wanted to share the cover art for the book with you! Enjoy…and please pre-order with vim and vigor. Life Labs and the Community Charter School of Cambridge. Students at Community Charter School of Cambridge show their surprise when learning that Christopher lost 14 pounds during the One Dollar Diet Project. Photo by Katie Rieser. During our recent trip to Boston, we had the pleasure of visiting the Community Charter School of Cambridge as guest speakers. At the invitation of a friend and colleague, this visit was both a chance for us to speak to students about our projects related to food and economics, and for us to observe a school that is far different from the ones we teach in. We spoke to three different classes of ninth grade humanities students, and when we were finished, their questions, and overall inquisitive natures, forced us to reflect on how things have been going, and how our experiments continue to shape our daily lives. These students also knew about the power of this type of experimentation and reflection first hand, as they had recently finished projects of their own. Over the summer, I had the privilege of being a fellow at the Ahimsa Center for Nonviolence at Cal Poly Pomona, and during my time there I spent two weeks learning about the lives of Mohandas Gandhi and Martin Luther King, Jr. As a requirement for the fellowship, participants needed to create two lessons for classroom use that would help our students better understand these men, and about some of the concepts related to their lives. For those who have studied Gandhi, it is clear that he saw much of his life as an experiment. In fact, his autobiography is titled, “My Experiments with Truth” and so I decided that one of my lessons would ask students to do the same thing. They would have to change one thing about their lives for the period of one month in order to learn more about the subject, the world they live in, and ultimately about themselves. I named the project “Life Lab”. While I played around with the idea, a new friend of mine from the institute liked it so much that he decided that he would do something similar with his students in the fall. Which is what brought us to CCSC. My colleague, Henry, had his students do a “sacrifice” project in connection with their humanities content. In fact, his students completed their projects before my students even began theirs. Like us, students had to do without something, and blog about their experiences. After we were done speaking, the students reported to us that throughout their projects they found that their grades went up, the number of detentions went down, and for some of them it was their favorite assignment to date. 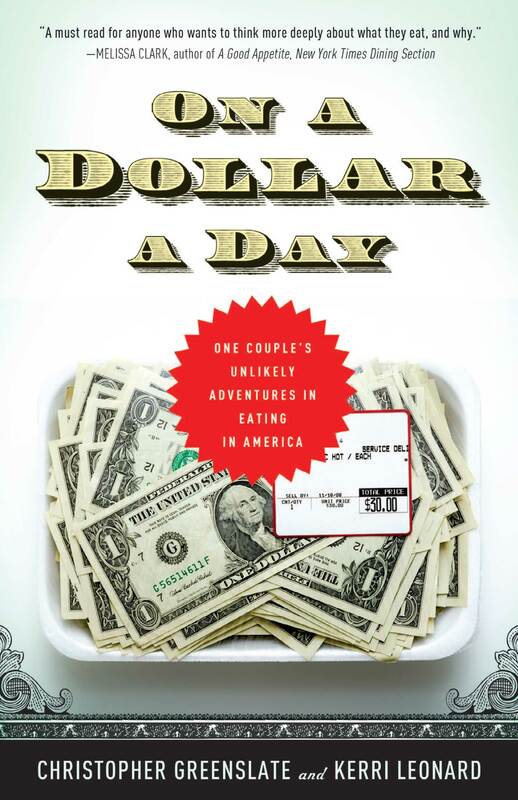 The fact that the concept of our One Dollar Diet Project could be elevated to a class assignment where students choose their own topic and find meaning through experimenting with their lives, is both a powerful testament to trying on new ways of living, and humbling for us as teachers. If only more schools like CCSC had teachers like Henry who found engaging and unpredictable ways for students to learn, we might just unleash the genius that resides in each student who would otherwise be counting down the minutes on the clock. ps. In the future, the LifeLab assignment handouts and description will be posted on our site…so, stay tuned! New York Times Lesson Plan that includes us! While it’s taken us a while to find out about this, it’s still relevant. 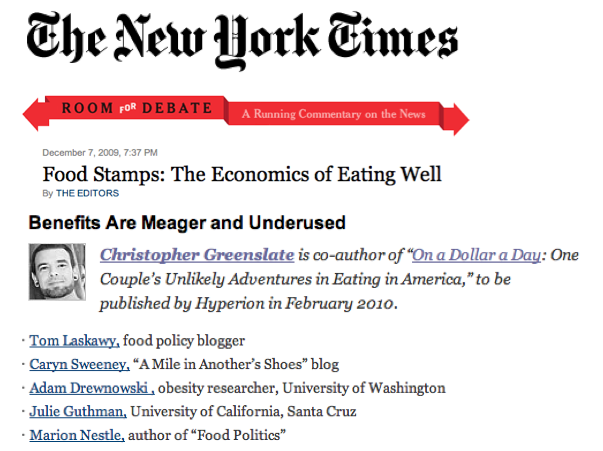 So, for all of the teachers out there, here’s the lesson plan that The New York Times Learning Network designed concerning eating and economics, and of course, it includes our blog/project. As teachers, we were flattered to find out about this, and look forward to including more lessons for teachers when the book comes out! If you are a teacher, and already have lessons about eating and economics, or the food system, please get in touch if you’re interested in sharing. 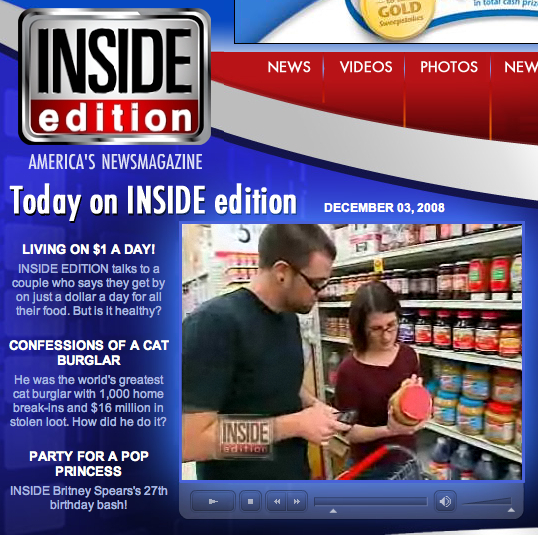 As seen on INSIDE EDITION. My face still hurts from laughing so hard. Watching our project get sandwiched between Brittany’s birthday bash, and a walrus forced to play the saxophone was beyond funny. In a blinged-out bra battle, where shiny people give the bewildered herd one more distraction (keeping the masses intellectually anemic), irony stood up and demanded laughter. After close to five hours of filming, which included an in-depth interview concerning poverty, nutrition and global issues, our “story” was reduced to a fluff piece with dramatic rhetorical questions; leaving nothing for the viewer to hold onto except the next piece of popcorn. Yet, the smile begins to fade when you consider that over 26,500 children died today from poverty related causes. Most of them preventable. We didn’t do this experiment to “make a statement”, but through all of this we have injected ourselves into some important conversations. Even now, two months after the fact, we continue to learn from the experience, and are hungry for more. If you watched tonight, we’d like to say “thanks”. Not just for weathering a full-frontal assault on your intelligence, but for being smart enough to laugh at the outrageous and support us anyway. Special thanks to our friend Krista for letting us invite ourselves over for a free meal and access to cable. P.S. If you missed it, click here.